Friday 5: Band Geeks, Daydreaming, Brian Williams | Where's My Eraser? I was never in marching band, but through serendipity I’ve been surrounded by bandos for the last seven or eight years. 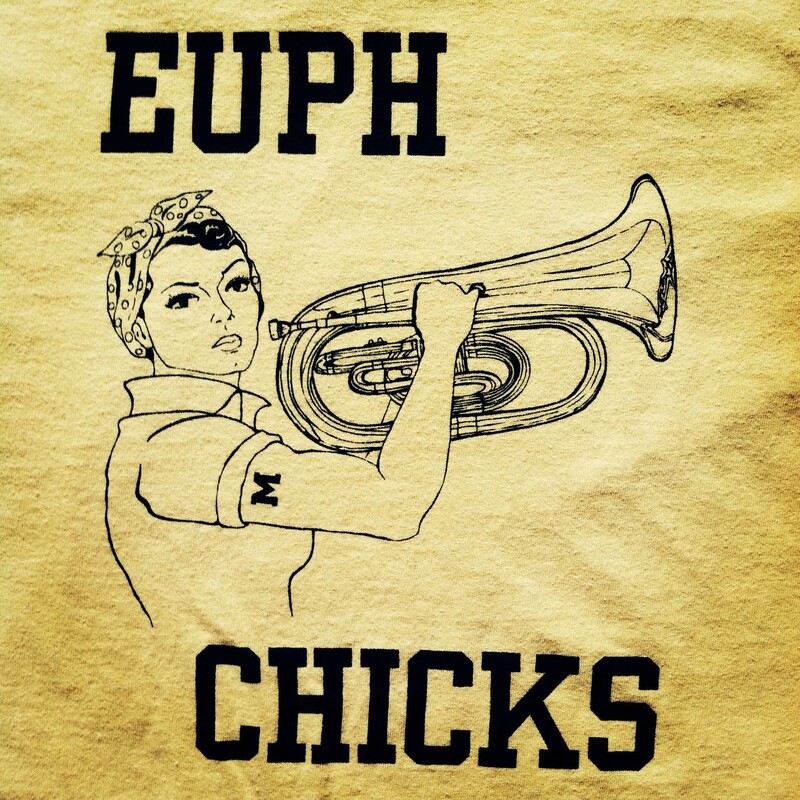 (The shirt design was drawn by my best friend Brita Thorne for her euphonium section of the Michigan Marching Band. Even the girls end up with serious guns by the end of the season). This Huffington Post article “17 Signs You Were a Band Geek” caught my eye because my brain seems to be permanently programmed to gravitate toward all things band. Not sure if my band friends would agree with everything on this list, but the photos are pretty spectacular. In an older article that somehow resurfaced this week, “Why Daydreaming Isn’t a Waste of Time” shows us that letting our minds wander from time to time is actually wholly necessary. More importantly for educators, children need these sorts of opportunities for reflection. “A lack of time to daydream may even hamper kids’ capacity to pay attention when they need to,” the article points out. With all of the distractions and stimuli that kids experience these days, getting time to daydream is more and more difficult for them. In yet another aspect of brain development, we see that an overemphasis on external forms of academic achievement can hamper the internal reflection and organization that is needed for achievement in the first place. Do you know what all of these terms mean? I don’t. This Gaggle.com post “12 Cyberbulling Terms You Probably Don’t Know” and its link to the dosomething.org website exposes how kids are often ahead of their parents and educators in tech savvy, often to the detriment of other kids. Parents are justifiably concerned about whether their children are being bullied, but it’s just as important that they’re vigilant against their children doing the bullying. Check out this article and its link to find definitions of these and other common online bullying terms. Social studies educators, this will make you want to sit down on the floor and cry like a little girl (I’m assuming you get that West Wing reference). To those of you who are reading this outside the US, I’d say don’t judge us too harshly, but we deserve it. I’m judging us. This video of American-born citizens is pretty depressing, demonstrating just how woefully uninformed people are about their own country. All any American has to do to figure out the name of the vice president is turn on the news. No wonder nobody votes anymore. They can’t be bothered to watch Brian Williams unless it’s for one of those Jimmy Fallon rap remixes. You know, I think we all deserve a pick me up. Not education-related, you say? I’m gonna argue that these guys learned enough in English class to know how to rhyme and enough in music class to string a tune together. (I know ‘Gin and Juice’ is newer, but ‘Rapper’s Delight’ has a special place in my heart.) Happy weekend, everybody. This entry was posted in Friday 5, Teaching and tagged Brian Williams, bullying, citizenship test, cyberbullying, daydreaming, edtech, Education, latenight, marching band, musiced, social studies on April 25, 2014 by Chris Thelen.